For the past god knows how many years because Paul Rudd doesn’t age, every time the actor appears on whatever show Conan O’Brien happens to host, he slips in an absolutely ridiculous clip from the terrible McDonald’s-sponsored film Mac And Me. It’s a whole thing. Most of the time, the clip is disguised as being from whatever movie Rudd’s ostensibly promoting, though O’Brien’s grown wise to Rudd’s game and seemingly still holds out hope that one of these days the actor might just show a clip from some new movie and not some dumb E.T. knockoff. Thankfully for fans, though, Rudd perseveres. 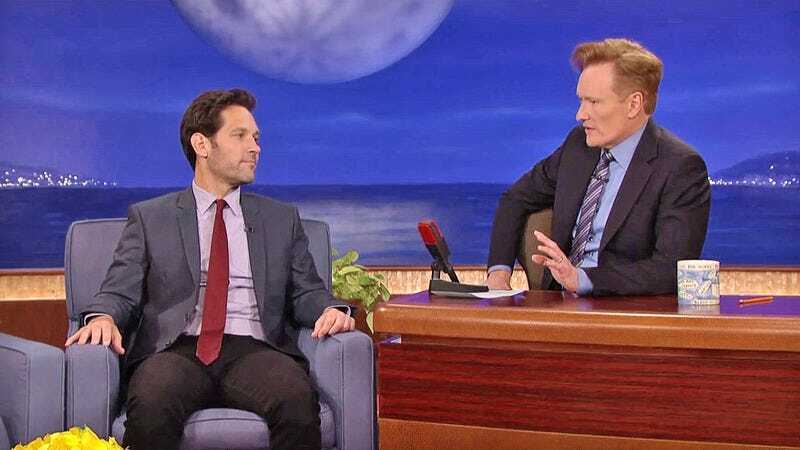 He was a guest on last night’s episode of Conan and, true to form, brought along a “clip” from his “new movie,” assuming Ant-Man somehow involves a kid in the runaway wheelchair. Rudd played like he wouldn’t do it, claiming that Marvel had him on promotional lockdown. He even played part of Ant-Man. But then, of course, things go awry, and Rudd’s movie character contributed to that kid’s unfortunate plummet not once, but twice.